There's a reason I'm not a food blogger. I lack the required domestic genes. I love food. I love beautiful food. But I can't create beautiful food. from The Pioneer Woman's site are what inspired my latest culinary/crafty attempt. ...if you eat them with your eyes closed. They don't look anything like her lovely, symmetrical scones. Mine are more like vanilla bean blobs...but they are tasty blobs. People like me should stick to playing in the dirt and leave the prettifying of food to the experts. But then—I don't always embrace commonsense. So, in my efforts to make the scones look less horrific, I decided to try a little artsy craft, inspired by my weekend gardening chores. I planted pansies. Lots and lots of pansies. I love pansies. They're just so stinking cheerful. Today is one of those dreary fall days when we gardener-types lament the end of summer. It's gray. It's raining. It's nap-inspiring. The banana tree is melting from the frost, it's yellow leaves drooping like the peel of its fruit. The lantana's leaves are crackling-black—or were, until I chopped them off Sunday. The beech trees look splendid, as do the Japanese maples...but I know those colors will be gone soon, too. But pansies? They're my saviors on these bleak days. Just look at their adorable little faces. Such personality! Such expression! Such a bright plop of color to fight off my bouts of Seasonal Affective Disorder! In our zone 7b climate, pansies are the perfect pick-me-up for fall and winter gardens. When I lived in the north, pansies were a spring/summer flower—they wouldn't survive the sub-zero temperatures and drifts of lake-effect snow. But in Upstate SC? They surround our mailbox, line the front walk, huddle in containers on the deck. Violas guard the lettuces and brassicas in the potager. And, occasionally, they are guinea pigs in my domestic goddess endeavors. Pansies and violas not only add color to the garden—they are also edible flowers. Well—they're edible IF they are raised organically. Please be careful if you think you can start munching on the flowers at Lowe's or any other big-box store or nursery, because you may well get a mouthful of pesticides or chemical fertilizer. Just a warning--no lawsuits, please. Pansies and violas have been valued throughout the ages. Since the 4th century B.C., the Greeks cultivated violas for herbal medicinal use. Much later, the viola inspired William Shakespeare's romantic writings. The pansy, whose ancestor is the viola, was discover some time after the 4th century B.C. in Europe. Thriving in alpine meadows and on rocky ledges, the plant was named a wild pansy. Possibly, a person living in France may have discovered the plant, as the word pansy is traced back to the French word “pensee,” meaning thought or remembrance. The early wild pansy (now known as Viola tricolor) was different from the viola. The wild pansy grew from the ground on one main stem, then branched above ground. Viola plants branch below ground with many plants sharing the same root system. The wild pansy bloom was larger than the diminutive viola. The popularity of the flower inspired much cross-breeding to produce different colorations and designs. Today, hundreds of varieties of pansies and violas are available in a rainbow of colors. Pansies and violas continue to be popular with herbalists and confectioneries. From tea to cure coughs to decorative designs on cakes, the viola family is both ornamental and practical. So. I faced a dozen ugly scones. Half a flat of pansies remained after my weekend planting frenzy. Why not try to hide my ugly scones under beautiful, edible flowers? Seriously, how hard could it be to make crystalized pansies? First, I picked a few flowers, washed them, and let them dry. Using a pair of tweezers, I attempted to hold the flower on its base and removed the stem with small scissors. Then I gave up on the tweezers. 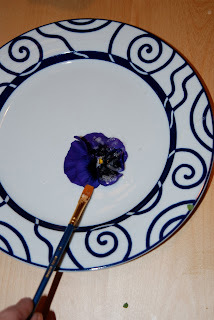 I next applied a thin layer of the meringue mixture on each side of the flower with a small paintbrush. The instructions said to "hold the blossom over a bowl or plate, and sprinkle superfine sugar over the entire flower. Repeat on reverse side." I just put the flower on the plate and sprinkled the sugar on it. Finally, place the flowers on superfine sugar-covered parchment or waxed paper to dry. I missed the “sugar coated paper” step and just placed them on parchment...they stick. A lot. Definitely put a layer of sugar on the parchment first. You will be much happier. The flowers should be dry in 2 - 4 hours. (Hmmm. It's been about 24 hours, and my flowers are still sticky. 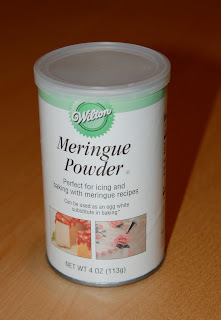 Perhaps I went overboard with my meringue painting?) I even turned them so they would dry evenly. You can, apparently, freeze crystalized flowers for up to a year. I don't think I'll bother. So, here it is—my ugly but yummy scone decorated with my crystalized pansy. I don't think the pansy on the scone makes it look any better. It looks like a soggy pansy on a malformed scone. I think I'll stick to putting pansies in salad. Or dirt. I accept that I'll never make it as a food blogger. But my yard and containers make me happy. Until spring. Only 124 days until spring.